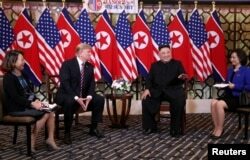 U.S. President Donald Trump and North Korean leader Kim Jong Un pose before their meeting during the second U.S.-North Korea summit at the Metropole Hotel in Hanoi, Vietnam Feb. 27, 2019. และเมื่อถูกผู้สื่อข่าวถามว่า จะมีการประกาศยุติสงครามเกาหลีอย่างเป็นทางการในการประชุมครั้งนี้หรือไม่นั้น ผู้นำสหรัฐฯ ตอบว่า "รอดูกันต่อไป"
U.S. President Donald Trump and North Korean leader Kim Jong Un sit down for a dinner during the second U.S.-North Korea summit at the Metropole Hotel in Hanoi, Vietnam Feb. 27, 2019. 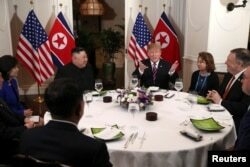 North Korean leader Kim Jong Un gestures as he and U.S. President Donald Trump sit down before their one-on-one chat during the second U.S.-North Korea summit at the Metropole Hotel in Hanoi, Vietnam, Feb. 27, 2019.